It's never been easier to generate more revenue with PotGuide and Baker. 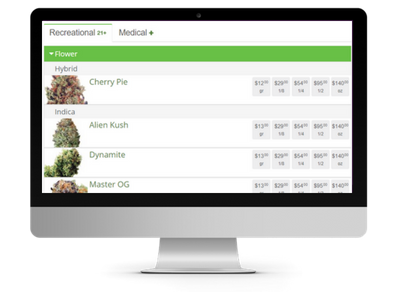 Integrating your dispensary menu with PotGuide is consistent, reliable and completely customizable to fit the needs of your business. An effective online menu integration improves the consumer experience, builds brand loyalty and can help speed up the sales process in your dispensary. Best of all? PotGuide’s menu integration via Baker is completely free to utilize! We understand that some of the most important assets of a dispensary are its staff, which is why we built our menu integration to update seamlessly behind the scenes of your bustling business. Say goodbye to having your employees update online menus. With real-time menu updates from PotGuide, you can save time and keep your budtenders on the sales floor helping customers. Just set it and forget it, it’s that easy! PotGuide’s highly targeted audience is comprised of over one million engaged consumers who are actively seeking to learn about and interact with reputable cannabis businesses. Broadcasting your dispensary to PotGuide’s consumer base is a great way strengthen brand credibility, increase customer acquisition and help boost your bottom line. With plenty of cost-effective advertising options available, PotGuide is here to help you generate a positive ROI on your marketing budget while reaching the largest audience possible. PotGuide offers complete dispensary directories, 420-friendly lodging options, cannabis-related events, and activities, plus dispensary deals. Businesses can claim their listing(s) for free then take advantage of additional complimentary advertising options including menu integration. From point-of-sale systems to digital signage to delivery - we've got you covered.